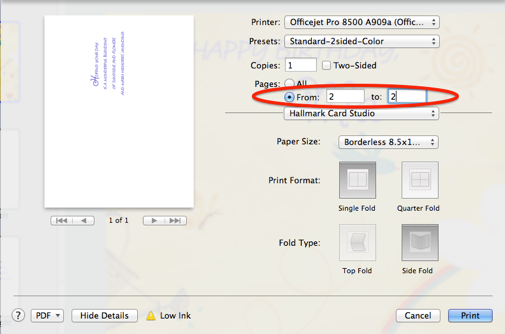 As many users have reported they cannot print second page when using the Hallmark Card Studio for Mac boxed edition. I just figured out how to make it work and couldn’t wait to share it (I also posted this solution on the SoftCity forum). This solution does not require printing to a PDF, as suggested on SoftCity forum. 5) Once first page is printed, remove paper from output tray and reinsert into paper feed (you will have to test to see how you need to feed it, but with my HP OfficeJet Pro 8500 I remove and rotate it so the side that came out first goes in first and place face up). It’s a pain that the “print page 2” dialog box doesn’t automatically come up, but at least I can use the product again get it to print without going to PDF (which didn’t work for printing to edge). 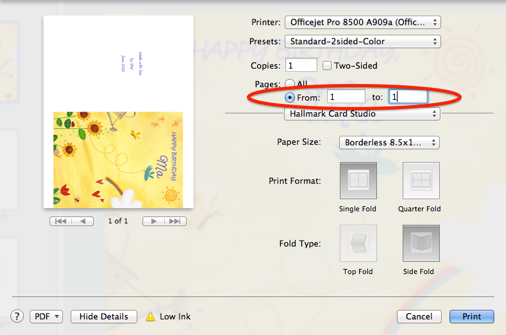 Now, Hallmark (or whomever is writing the code) fix your print routine!! As an IT professional let me personally scold Hallmark (or whomever) for abandoning your boxed edition users! Some of us cannot (or do not want to) use the download version and want to be able to work “offline”!! Hope this helps all the users out there struggling for nearly ONE YEAR! P.S. As I mentioned, I posted this solution at SoftCity forum here. Thanks, Mama, for teaching me right from wrong! Perfect solution. I had my doubts, but it worked perfectly. Thanks!